One portion of our garden is dedicated to mint (which appeared this spring without even needing to be replanted!) and while it grows and spreads quickly, there is only so many mojitos and smoothies one person can make. 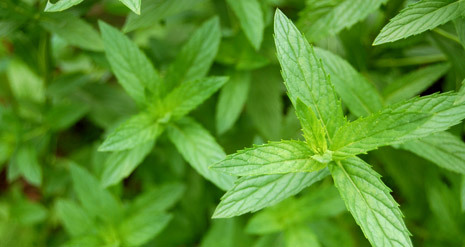 The first step, which is the most important and time-consuming, is drying the mint. Pull it out from the base and make sure to hang it or dry it on a screen to expedite the process. During the hot summer time, this should only take a day or two. Next, remove the dried leaves from the stem and throw a “handful” (1-2 loose cups to taste) into a 2 quart pot of water and boil. Once boiling, turn off and let the tea sit, or steep, for approximately 15 minutes (but again, you can alter this to taste). Then pour through a strainer to remove all the leaves. * Serve hot, or cool and refriderate for refreshing iced tea. * If you have a strainer or colander that fits in the bowl toss the leaves in there and bring to a boil follow the steps above and pull the colander out after the steeping has finished for an extra easy cleanup. Ok, putting this on my “list” of things I want to try. Next spring, I’ll grow the mint, then give it a try! Thanks for the recipe! Hi thanks for that �recipe� on making mint tea. It is wonderful to know that it is so simple. As you said, probably drying the leaf is the most time-consuming part. But given the benefits of mint and the fact that it can be grown right in our backyard and used for preparing tea, this is not an issue at all. This is a great way to have �green� tea. I love making tea straight from the garden – my favourites are lemon grass and mint. So easy!